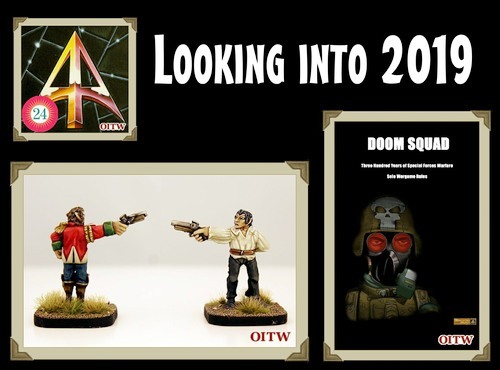 It has been a whirlwind of a year for us and now that it is at an end we thought we would give you a little snapshot into what is going on at Alternative Armies and the plans we have for what we will be doing in 2019. Possible and Confirmed Projects. What can you look forward to roughly in the first half of the next annum? Perhaps things like En Garde for Valon (the follow up to classic The Duel game) and Hazabot for Science Fiction (can you clear an infested space station?). 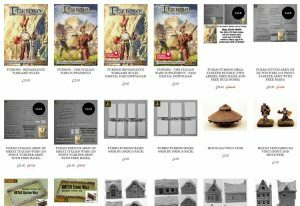 Confirmed is a follow up title for Sengoku, three more USEME books, a lot of 15mm and 28mm miniatures, expanded 6mm and more besides. 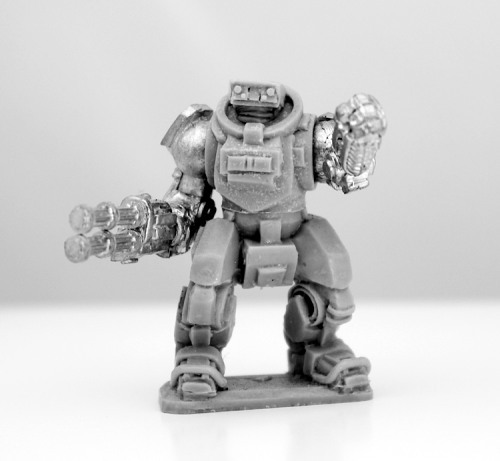 Plus there is news on The Ion Age. A lot to read. Find out in full with the whole article which is over on Orcs in the Webbe. Go HERE to read it and thanks everyone for your support. 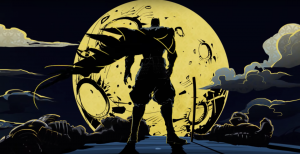 Our own feelings upon it were that the animation was superb with backdrops much like paintings from the Edo period (Japanese history is one of my passions) and that the action sequences were very well done. The voice work was fine but the Batman character fell short of his regular brooding menace. The plot was thin but rather than use this as a negative it was actually for a reason in my opinion. 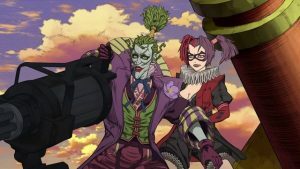 The anime was made upon of scenes. Each scene focused upon giving homage to a type of anime style and setting. Across the span of play we had ninja films, Kurosawa tribute, water colour tragedy, giant mecha fight and more. The plot simply acts to move the scenes forward. The film can come off as strange and oddly paced if you do not have a grounding in the culture that is comes from. It is a Japanese film made for that audience and it shows in the dialogue and seemingly odd choices by characters. 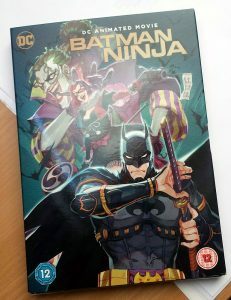 Overall we enjoyed it and if you want something that’s a bit different from the usual DC animated stories here’s an answer for you. 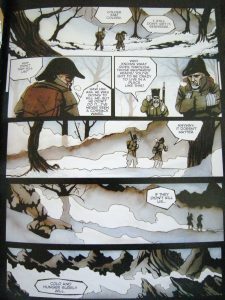 It was my great fortune to be recommended a graphic novel by a customer of Alternative Armies who is a big fan of Flintloque and especially the Escape the Dark Czar setting. 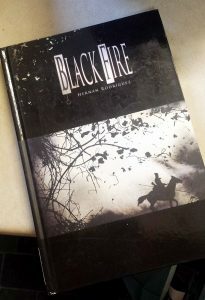 Black Fire by Hernan Rodriguez which was not easy to get but I did find a hard back copy of it second hand and when it arrived from the states I had intended just to flick through it…an hour later I had stood and finished it…wow. 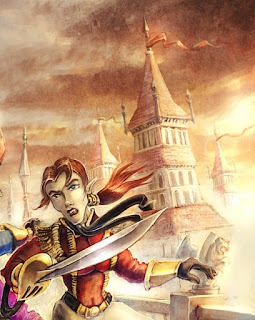 Two soldiers in Napoleon’s army retreating from his disastrous campaigns in Russia are separated from their unit by a Cossack attack and stumble across an isolated Slavic town where strange and bizarre doings are afoot! Linking up with another unit of lost French soldiers, they try to figure out where they are, only to discover that the ancient, abandoned town is deep, forbidden territory the prison of a dark monster-god out of Slavic legend and nightmare, which seeks to use the newcomers to escape! 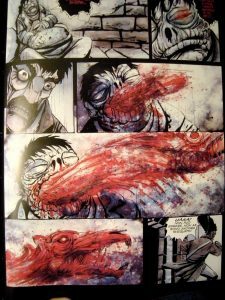 Black Fire is an original graphic novel by Hernan Rodriguez and published by Archaia. It is full of Lovecraftian horror. This is a story set during the French retreat from Russia during the Napoleonic War. It is about starvation and frostbite. It is about an abandoned snowbound village. It is about evil. It is about a Russian god of death, fire and darkness. It is about creating a mood of dread, fear, and paranoia (if paranoia is, in fact, a mood). It is about the nightmare that occurs with the juxtaposition of human failures and the malevolent forces of the universe. It is a great story. Hernan Rodriguez has cobbled together an epic dark fantasy of large proportions. His expressionist style artwork marries muted colours with blasts of reds and oranges tightly contained in thick black ink, all of which propels the mood deeper and deeper into the horror that the plot unravels. His line work is perfect for the tone of this story. This is a book well worth seeking out if you like Flintloque or indeed the work of Lovecraft too. No Orcs or Elves or Zombies really in this one but the same feel as the Death in the Snow setting. How differently things could be done. I got mine at Alibris but copies can be found on Amazon and Ebay too but watch out for the prices…I paid 12GBP and it was worth that, but some people want three times that. 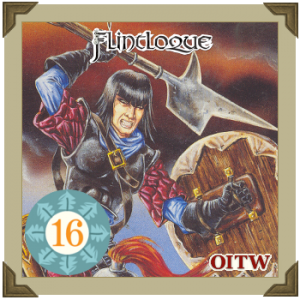 There is no creeping horror in Flintloque like this but if you change the Humans to Elves the tone is spot on. Above Undead Toadmen seek out mortal Elves! 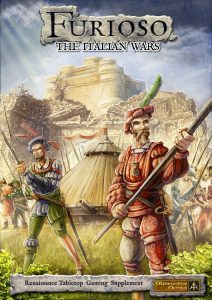 Furioso Italian Wars landed today! A great day today with a new book put up on the website and beginning shipping out to customers and to trade contacts as well. The follow up to Furioso a wargame set in the 16th century is its expansion which is all about Italy and city state war and semi-historical machines of war. A blog article in detail on this new book by me HERE. I am a great lover of Leonardo Da Vinci and his genius and when Steve Danes spoke about creating an expansion for Furioso which would deal with this I was really excited. The book was in development for several months and I now have my own copy which I will be reading this weekend. If you want to see the book and more then go to the Alternative Armies website. The artwork on the cover was created by Sam Croes and really captures the essence of the title. Pike, soldiers, wooden tank, castle and the sunny climes of Italy. I might even get it printed as a big poster! I have just finished reading 12 Rules for Life An Antidote to Chaos by Jordan B. Peterson. It was a truly excellent book and I also listened to it on Audible too told by the author himself. A professional clinical psychologist who has taken great time and great effort to try to explain the world and a way to live within it. It is a valuable book which I think anyone would benefit from listening to. That said the sheer hate he is subjected to by people who frankly strike me as a bit insane. ‘Hate Speech’ they call it. Well sadly for them the contents of this book are rational, incisive, provable and backed by experience and history. I could find no fault with it. It resonated with me. If you wish to know more please go to Google and look for reviews of this book and you will see what I mean (Financial Times, Guardian etc). History will repeat itself if we are not careful. Live a good life, do good, gain in experience, be grateful, value free speech, respect the Christian tradition, raise a family well and take care of your children and parents. It is a great book and I challenge anyone to take the notion that what it says is wrong based only on a narrow ideological basis. Nihilism is a dangerous thing and must be combated just like the attempt to destroy the very foundations of the civilisation which has brought life and prosperity to all us poor apes. Go HERE for the penguin books page on this title. It will be the best money you will spend this year. I should also point out that George Orwell and Aleksandr Solzhenitsyn are greatly admired by me and I shudder in terror of the left wing now. by Adrian Tchaikovsky which I have just finished listening to on Audible. Desperate to find a new home amongst the stars, the last remnants of the human race which persist in the ruins of an earlier stellar empire are thrown out into deep space. Hundreds of thousands in cryo asleep aboard a colossal colony ship until a habitable planet is located. Eventually they discover a world which was ‘successfully terraformed’ by Professor Kern during the gone era of the Empire. Left Abandoned by Humans, this new planet isn’t the unoccupied Eden they had hoped for and is populated by two other forces who fight for power and territory. They are not men..not even close. Until Children of time the author had really focused on Fantasy and hadn’t turned his hand to writing science fiction novels. It is a move I’m glad he made as Children of Time is not only a rewarding, memorable novel but one that can take its place amongst the finest science fiction. The story alternates between the humans on board the colony ship (Gilgamesh) and the changing creatures on the terraformed planet. 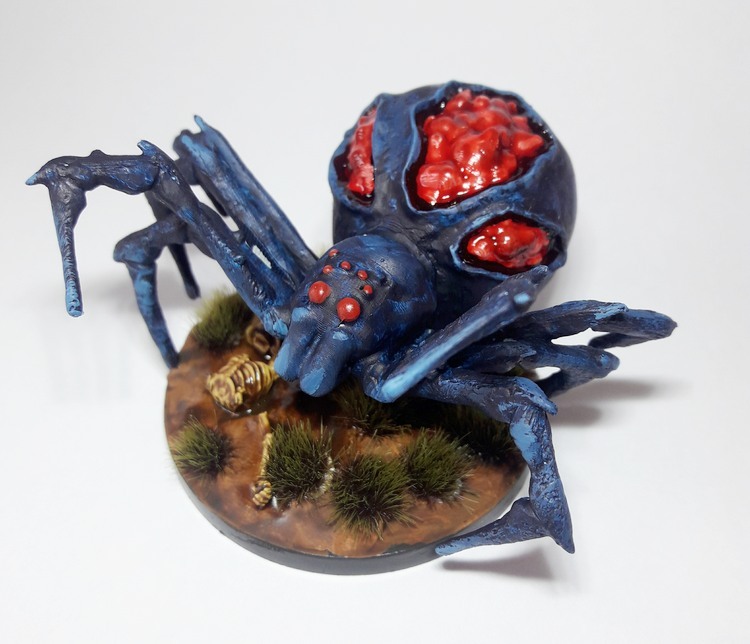 These creatures have been given a helping hand to evolve after a nano-virus that was meant to uplift monkeys instead finds the most promising of creatures on the freshly terraformed surface. We get to see how creatures such as spiders and ants could evolve in a short space of time (relatively speaking). The book travels forward as these creatures evolve while aboard the Gilgamesh the opposite happens. Devoid of the knowledge required to effectively repair or improve their ship, life for the humans gets difficult. There is a sense of wonder and immersion, being carried along on an alien world with hosts both familiar and strange at the same time. 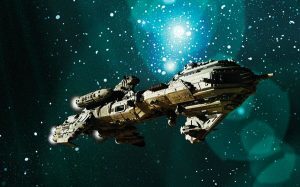 The novel also has the grand vision that is a characteristic of a Peter Hamilton’s space opera. It’s a combination that works perfectly managing to describe the evolutionary steps of earth-like creatures in a realistic fashion. 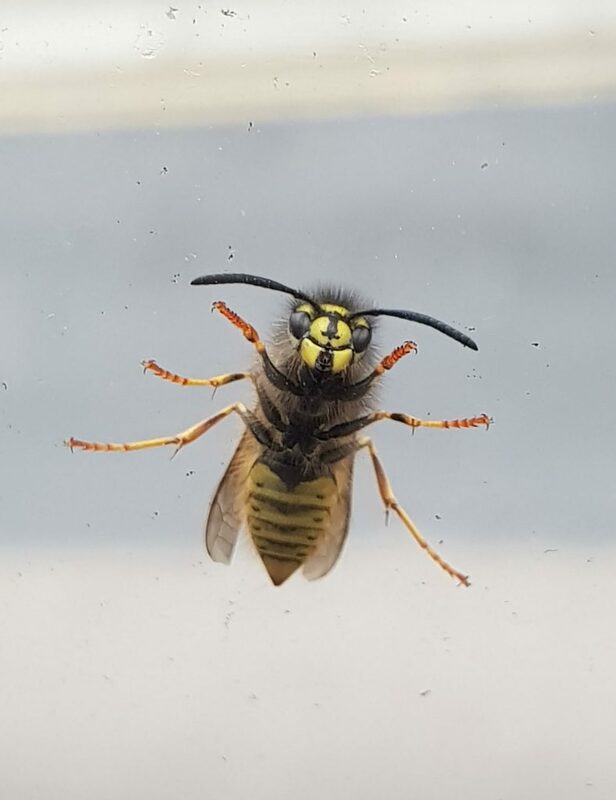 Its clear the author has a fondness for insects. The way that future technology is described is both modern and creative. This distant view of our culture and society, while a small part in a much larger story, really strikes a chord. It’s the way that the uplifted race of creatures are described that sets the book apart though, the juxtaposition between human and non-human is both reflective and distinct. 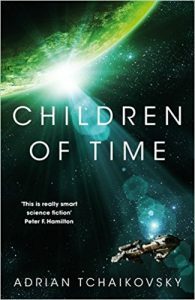 Children of Time Explores themes of religion, evolution, sexism and the nature of humanity along with what it takes for a species to call something “God”. The book also provides an effective example on just how evolution can work and just what makes one species superior to another. It’s a mind-blast, thought provoking story just full to the brim with ideas. The book that essence of the classic science fiction novels, that sense of wonder and unfettered imagination but combined with this is the charm of a writer who really knows how to entertain, how to spin a good story. Essential science fiction and a book not to be missed. 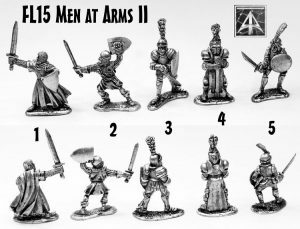 Humans in 3rd Edition Flintloque – Advent 2018! A broken tusk jutted from its lower jaw and pierced through its upper lip drawing blood. The arrow had grazed the mouth. With its free hand the Orc tore two more arrows from its chest breaking the wooden shafts with apparent ease. It awaited the order. Blood trickled down its face staining the rough white fabric and leather around its neck. Blood flowed out of injuries and mixed dark with the red of its crudely stitched coat before dripping onto its course black leather boots. It awaited the order. Ahead the Hoomans rode horses their armour sparking brilliant in the sun; lances shining as they began to charge. Arrows rained down from the Men further back behind the riders and struck the Orcs along the thin two deep line drawing grunts but no movement; a couple of Orcs toppled forward onto the grass. It awaited the order. The spear had been lighter, the spear has been faster but the spear was gone and now he had Bessie. The order was shouted gruffly. Bessie moved from resting on the shoulder into both hands and up until it pointed at the Hoomans. The plains had been his hunting ground and the spear had thrown far and silent. Now the ranks and the lash for speaking out of turn. Bessie spoke with fire and anger but there was no fear. 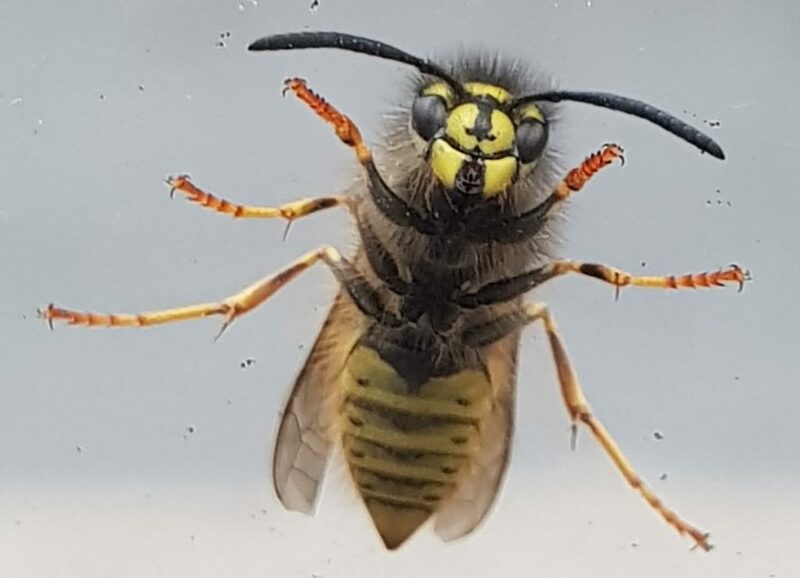 No fear now of the Hoomans. The lances came down to level and then gouts of grey smoke and fire stabbed out and the Men died. Dresda was theirs and his Lordship would give sips of Ladye Juniper to all who served in the ranks. Blood mingled with bitter powder as the unbroken tusk bit into a new cartridge and then he spat the lead ball into Bessie’s smoking maw. It was my great pleasure to make my entry into the 2017 Advent Calendar over at Orcs in the Webbe and article at the request of the site’s owner Craig Andrews. I write an article each year for his birthday on or around the 18th of December. 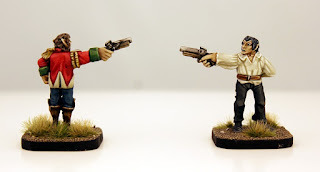 This time it was a play tested article for using the now vanquished Human race on the battlefields of Valon in the time of Flintloque the Skirmish. You can read it HERE and download a formatted PDF of the article on that page too. 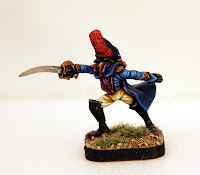 I do not play Dresda but others do, the game first made for Alternative Armies range of High Fantasy miniature. I wrote DarkeStorme to replace it and Flintloque does not really use Humans. Such as those above in the Knights and Footsoldiers part of the range. Orcs have wiped out Mankind and taken their cities including Dresda and now call it Londinium. 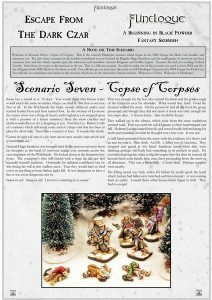 The article was fun to write and play out the scenario included in it. Humans are like Elves but slower and being afraid of black powder makes playing them in Flintloque tough at anything but close range. It does bring up some nice ideas though. In 2018 I will be working with other authors and creators to expand Valon even further with titles set in the twilight of the Crystal Empire of the Elves. Revisiting a classic title and also a brand new one too. There will be more on this at the time but for now I just wanted to say it is coming. Stay up to speed by following the Alternative Armies blog or facebook group. I leave you to enjoy the Advent Calendar and wish everyone a Merry Christmas and all the best for 2018 now just under two weeks away. Time flies. Artemis. 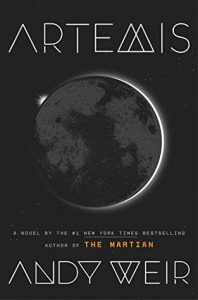 The new science fiction novel by the writer of The Martian, Andy Weir. I picked it up on Audible and hence listened to it rather than reading it. It was narrated by Rosio Dawson and ran at just under nine hours which I did in two sessions. I was greatly impressed by The Martian and a follow up for such a success would be very difficult…so..how was the story? So, what is Artemis? It’s…a few things, actually. The top of which is, it’s heist story. On the moon. It’s not just that, of course. The protagonist, Jasmine (“Jazz”) Bashara is being offered an opportunity to change her life…we’ll get on to that shortly. What I’m saying is that, though this is a heist story, one where careful planning and unexpected reversals are the order of the day, it’s also a story about a woman looking to make something of herself, and the book is as much about character and personality as it is about chases through vacuum and dubious law enforcement. The world well, it’s in some ways familiar, in others…less so. The moon is a harsh place, at least externally. It’s cold, dead, and the slightest mistake could kill you. There’s a certain sterile beauty to it, to be fair – but Weir has built a moon which can kill, and emphasises the fragility of life in that environment. The larger part of the world, though, is in the city which humanity has settled. It has a certain retro vibe to it – domes rising out of the moon rock, habitable areas underground as well as above. Relatively small, the cultural cadences of science and technology are interspersed throughout – this is a people who make up for their lack of numbers with intellectual capital and skill. The city bustles and thrives, and the industry around it – aluminium, for example – helps sustain it; it certainly feels both alive, and familiar – and at the same time, ever so slightly strange. Character-wise – well, the main focus is on Jasmine. I have a lot of affection for Jazz, as she’s known – a smart-mouthed young woman, with a laser-like intelligence and an impressive facility for saying the wrong thing at the wrong time, or otherwise putting her proverbial foot in it. Still, she has a sharp tone, and a degree of hustle and charm which it’s a lot of fun to read along with. We pick up some of her history through the text. This lets us explore wider issues as well, like how parenting, or nationality work on the moon, or the role of currency in the context of moon-living. Jazz is energetic and cheerfully self-serving, and if there’s hints of larger issues there – guilt, issues with authority, family difficulties – then they help make a more nuanced character. Jazz is backed up by a fairly large ensemble cast – from snide EVA instructors who also happen to be ex-boyfriends, to seemingly baffled scientists. Jazz’s father, a man seemingly confounded by his daughter’s ability to do absolutely anything other than apply herself, steals every scene that he’s in, with a combination of pragmatic competence and an obvious love for his daughter that pours off the page. There’s others of course – engineers in life support, and a particularly persistent lawman. I think my only complaint is that we don’t see enough of them. They’re there, and serve the plot rather well, and give Jazz the contrasts and banter in her life that we need to see – but I’d love to have seen them in more depth. The plot…well no spoilers. But it’s a lot of fun. In some ways it’s a slow burn, as facets of a plan come together. But there’s enough going on at every stage to keep you locked in. When things do kick off, then there’s heart-in-mouth moments aplenty, tension broken with chases, brawls, and the occasional explosion. It’s a journey in exuberant prose, which is taking joy in both the science and discovery of it all, and in the personal dramas, the horrible mistakes, the bare-knuckle recoveries and the personal triumphs. It’s not The Martian, but that’s a good thing. Artemis is strong enough to stand on its own. It’s clever, fast-paced, tense, and carries moments of sparkling humour and emotional weight. If you were a fan of The Martian, then yes, you should give this one a read. If you’re coming to Weir’s work for the first time – this is very much worth the time. So that is my review. I must also mention that the author did an excellent job of ticking all of the diversity boxes without causing any offence which is a hard thing to do. Kudos!